After Day 1's doozy of an activity (decorate the Christmas tree), I was feeling the need for a simple activity for December 2nd. 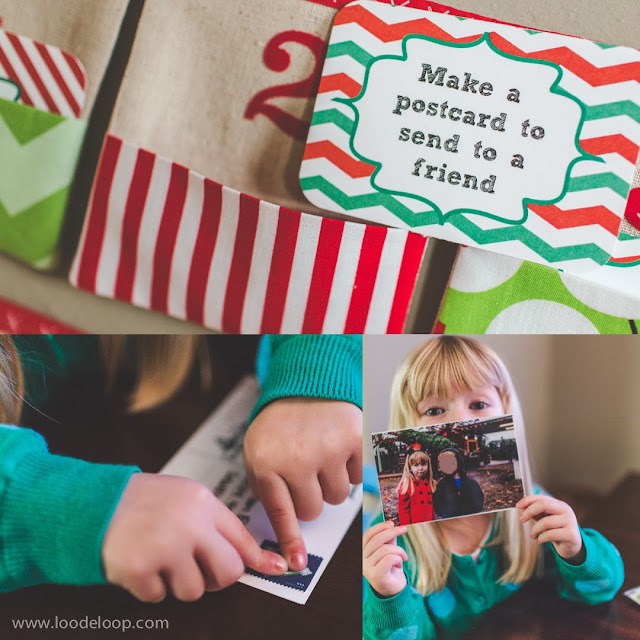 "Make a postcard to send to a friend". Simple enough, right? It's amazing how much mail fascinates a 3 year old. I used a 4X6 photo that I had printed off of her and her cousin at the tree lot the day before. I turned that photo into a postcard by using these great little sticky cards. 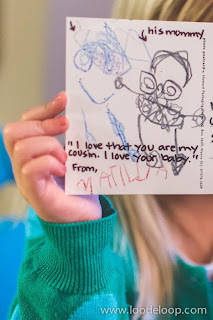 Then I let Matilda color whatever she wanted on the left side. She chose to draw her cousin and his Mommy (she's the one with all the teeth). I asked her what she wanted to say to him. She said, "I love that you are my cousin. And I love your baby." (He has a little baby brother that Matilda is smitten with). ❤️ Tilly stuck the stamp on and we popped it in the mailbox. Day 2? Done!